February is the time for KinoKino – International Film Festival for Children, whose third edition awaits at Europa Cinema in Zagreb from Wednesday, 14 February to Sunday, 18 February. The five-day film journey begins with the launch of the first eight-year-old into outer space, the heroine of the sci-fi comedy Up in the Sky. 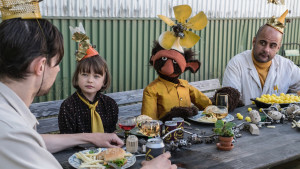 A little girl by the name of Puttan becomes part of a colourful bunch consisting of people and puppets on a secret project of outer space launch, after her busy parents leave her by accident outside a scrapyard instead of a summer camp. Critics already call this Swedish blockbuster a future classic and a film to be loved by the generations to come. Its premiere is scheduled for KinoKino Festival. Among eight feature-length films in competition of the third edition of KinoKino boasts the titles that differently portray childhood curiosity and children’s passion for exploring. From France, Germany and Cyprus to Columbia, the protagonists explore and change the world. In the Cypriot drama Boy on the Bridge a boy named Socrates, a lover of homemade fireworks, become the lead detective in the case of a mysterious village homicide, who solution will lead him to his own coming-of-age. One of the most awarded European children’s films of the past year, the German picture At Eye Level humorously speaks about living with a diversity and what happens when 11-year-old Michi, an orphan child, learns about his father he didn’t even knew existed, and how his euphoria suddenly fades when he meets Tom, the father who is shorter than him. Oscar’s America, by Norwegian director Torfinn Iversen, takes us on a journey in the middle of a dream about the American prairies of a boy named Oscar, his socially awkward friend Levi and one very special pony. Everything changes for the Columbian teenagers named Cornelius and Rita when they cross paths with an unusual goat. Convinced that it brought them bad luck, a series of unusual events is launched, but the quarrelsome brother and sister will finally reach the same page in the exotic comedy Bad Lucky Goat, taking us to the paradise beaches of the Columbian Carribean, with the obligatory sounds of reggae and a host of interesting characters. The films running for the festival award will be judged by a professional and a children’s jury. The three-member professional jury this year consists of one of our most distinguished actresses, Daria Lorenci Flatz (Sorry for Kung Fu, Metastases, Cannibal Vegetarian, Just Between Us), the famous Bosnian and Herzegovinian actor Moamer Kasumović (Crazy Confused Normal, Summer in the Golden Valley, Well Tempered Corpses), and Zdenko Bašić, the award-winning Croatian animator and illustrator. Five primary schoolers from Zagreb will be deciding on the best film to the choice of the children’s jury: Alex Rakoš, Anouk Kivađ, Armando Luque Akrap, Mia Mišković, Antonia Kurtović. The programme Classics with Guests, in addition to the iconic French classic Mon Oncle, as selected by the Sarajevo-based actor and this year’s jury member Moamer Kasumović, will include one of the most popular children’s films of all times, Karate Kid, selected for the KinoKino audience by the Croatian creative jack of all trades, director, actor, DJ and quiz show lover Mario Kovač. The side section Discovering Every Day includes five short films suitable for the 7+ age group, which will turn into a special interactive screening accompanied by a discussion about emotions. The discussion is organised by the members of the independent art initiative BoliMe, high school teacher Marina Vitković, actor Adrian Pezdirc, director Judita Gamulin and designer Draga Komparak. Wishing to make the children’s cinema-going experience as informative and entertaining as possible, KinoKino also features many special side events. After every moderated screening (Maja Kovač, Vedran Senjanović, Sara Stanić, Iva Šulentić), they will get a chance to discuss the films they just saw, as well as take part in workshops. Apart from the traditional My First Review workshop, giving a chance to the youngest cinephiles to become writers and critics, this year for the first time we are organising a workshop under the title Create Your Own Video Game, showing the participants the simplest way of game designing so that when the workshop is over they can make a simple game based on a film on their own. Another first-time workshop was Designing a Film Poster, in association with the award-winning studio Šesnić&Turković, and this get-together resulted in a new poster for this year’s festival opening film.